Have you ever seen such a stunning highlighter? Too Faced have launched three highlighters to suit different skin tones. The detail on the packaging and product is outstanding and looks stunning. Having highlighted cheekbones has become one of the most popular makeup trends and it isn't going anywhere soon. Every time I do my makeup I always use highlighter and this one from Too Faced doesn't disappoint. I have the Love Lights Prismatic Highlighter Ray of Light which is perfect for pale skin tones to dark skin tones. It has a pale pink/peach undertone with flecks of gold in certain lights. Too Faced always know how to stand out with their packaging and these highlighters stand out over any other brand. 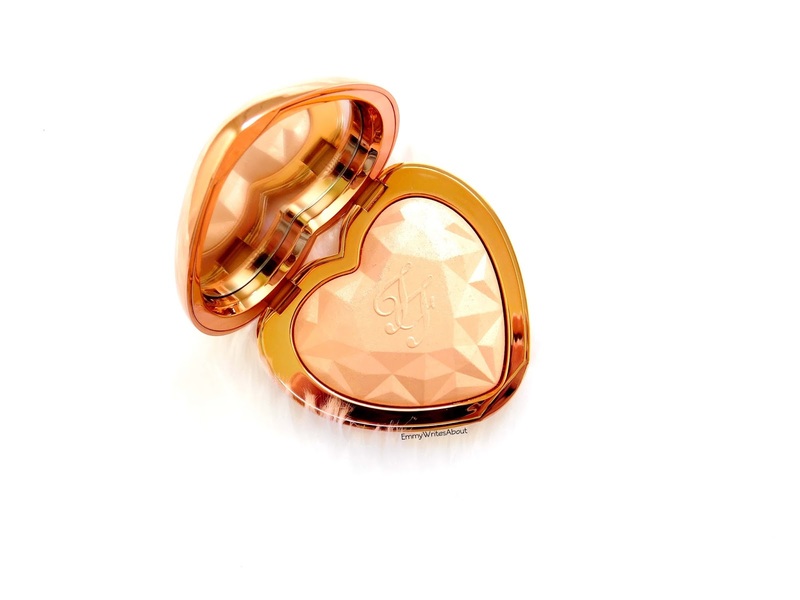 They come in the most beautiful rose gold heart shaped packaging, it reminds me of the little Polly Pockets you got as a child but of course alot more expensive looking. 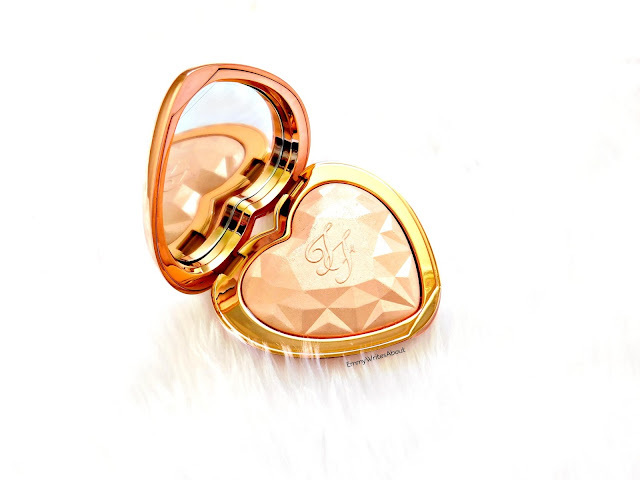 Too Faced say the Love Lights Highlighters combine the best powder, liquid, cream and baked formulas which make them the perfect highlighters. They have a pearl radiant finish that has a incandescent glow with mesmerizing metallic shine. Just look at the prismatic detail on the actual product imprinted with the TF logo. Oh my it is drool worthy! What I love most about this highlight is you can start off with a subtle glow or build it up to an intense blinding highlight. The formula melts into your skin and doesn't look powdery at all. As I mentioned it does has flecks of gold in certain lights but it isn't chunky or glittery, it is melted into the highlighter. I have tried applying it with different brushes and all apply it beautifully. You don't get any fallout when you tap your brush into it either! 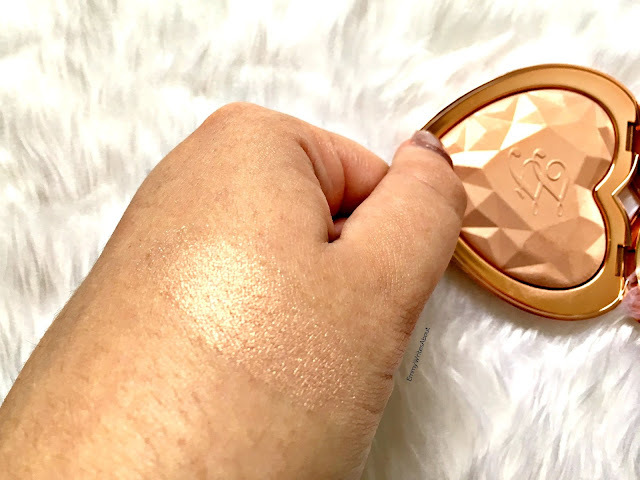 I especially love applying this on top of the Too Faced Born This Way Foundation as the foundation allows the highlighter to melt into it and look flawless all day long. 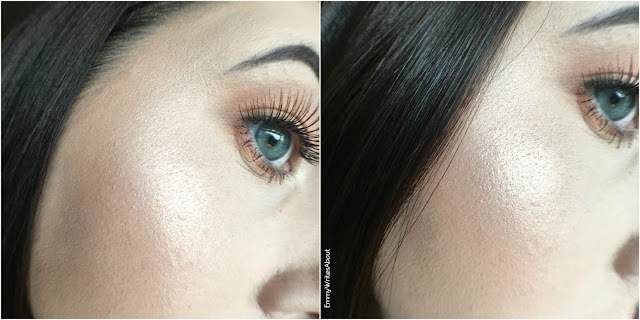 After trying this shade I definitely want to try Blinded By The Light which is a pearl champagne shade! I think Too Faced have created highlighters that everyone will love, whether you want a subtle glow or you want to blind your way through life! Annie from Musings of A Makeup Junkie also reviewed this shade and the Blinded By Light shade, you need to see her swatch!